Old outdated buses are overwhelmingly responsible for shocking pollution levels on Bearwood Road, according to a traffic survey carried out by Sandwell Public Health. 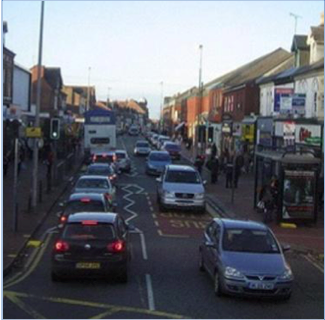 The survey, requested by Abbey Ward councillors, measured vehicle emissions on Bearwood Road between The Bear and the junction with Poplar Road, and used number plate recognition software and cctv to identify the most polluting vehicles. Buses contributed 57% of NOx (nitrogen oxide) emissions in Bearwood Road despite making up only 6 percent of vehicle flow. Cars contributed 31 percent of NOx emissions although they are 86% of the vehicles in the street. 29 percent of buses are Euro 2 emission standard or older (i.e. over 10 years old) and the majority of buses are using technology at least 14 years old. Although the bus companies attribute emissions to Heavy Goods vehicles, only 1% of the traffic flow is comprised of HGV type vehicles. For years the bus companies have argued that their vehicles do not contribute significantly to the pollution levels on Bearwood Road, but this report blows that argument out of the water. More detail on this via the Bearwood e-Bulletin which you can download via the e-bulletin page above. I’m going to get shouted down but sitting at the excessive pedestrian crossings must add to it as well. You won’t get shouted down Dave. We’re looking at a couple of features including putting on countdown timers so people can see the amount of time they have to cross, and co-ordinating the lights so that they all stop together and then all the traffic can move without continual stopping and starting. The high street carries too much traffic for its size and given the nature of some people who ‘own the road’ you need a steady but tamed flow I hope you can sort something out. Dave, I would argue entirely to the contrary. The pedestrian crossing provision is woefully poor. There is a huge wait to cross (with a baby, I’m not wont to cross on a red) and the time to get across anyway is too little: you can barely get across in the time allocated. Whichever road users get squeezed, it should probably not be the most vulnerable i.e. pedestrians, especially as these are the lifeblood to Bearwood Road’s footfall. I count six from the Bear Tavern to the Kings Head end of the high street with three in about 400 yards the time to cross I cannot argue with but that’s a lot of crossings for a short stretch. I don’t own a car by the way. I just don’t like the crossings…. No beeping sound… They feel unsafe. The one near St Mary’s road is poorly placed. You can’t blame the motorist or busses all the time. Talking of pollution… Can we get fluoride removed from the water. Mass forced medication by the state is wrong… Not a big supporter of the daily mail, but the point is well illustrated (http://www.dailymail.co.uk/news/article-2967791/Is-tap-water-poisoning-troubling-question-s-lips-scientists-war-fluoride-water-protect-teeth-spark-depression.html ) Seems strange that the more prosperous South isnt being polluted in this way? Mike, whilst I doubt we will get the fluoride situation changed, we are doing something with the crossings. The crossings are to be fitted with the sort of countdown timers you see so often on the continent. I agree about the crossing by St Mary’s, unfortunately…no-one else does!! !